For the last 6 days of my stay in Bali, I headed to Denpasar where Arya kindly agreed to host me. Arya is a former Balinese general practitioner who studied in Japan. She came back to Bali four months ago. While she might look young, don’t be fooled…. she’s one smart and educated woman. Holder of a PhD, she now teaches public health at a university in Denpasar. You can imagine Arya is not only a smart woman, but a busy one at that. Despite this, she made time to show me around. With Denpasar being a hard city to travel in, mainly due to a lack of public transportation, I was pretty much glued to her for those six days. While she felt bad for the time I spent confined in her office, I actually enjoyed the opportunity to go out off the beaten tourist paths. It was a good illustrative of how travel memories are made not only by the sights you see, but also by the company you keep. I got to have lunch with her and her colleagues. All three of them had studied in Perth (Australia) and were fluent in English. I also got to attend one of her lectures and had a first contact with her students. Granted, it took place in Bahasa (the Indonesian language) which I do not speak, but I did pick up enough to understand the lecture was about a government initiative focusing, amongst other things, on fighting anemia caused by malnutrition. Under this program people can get free iron tablets. However, it seems the tablets taste horrible, which makes the program somewhat unpopular. In her lecture, she also put forward the idea that in order to combat malnutrition, more efforts should be put into growing and consuming local foods. Does this ring a bell for my Canadian friends? Finally, I also got to have an informal discussion with some of her students and together we compared the Indonesian and the Canadian health systems. 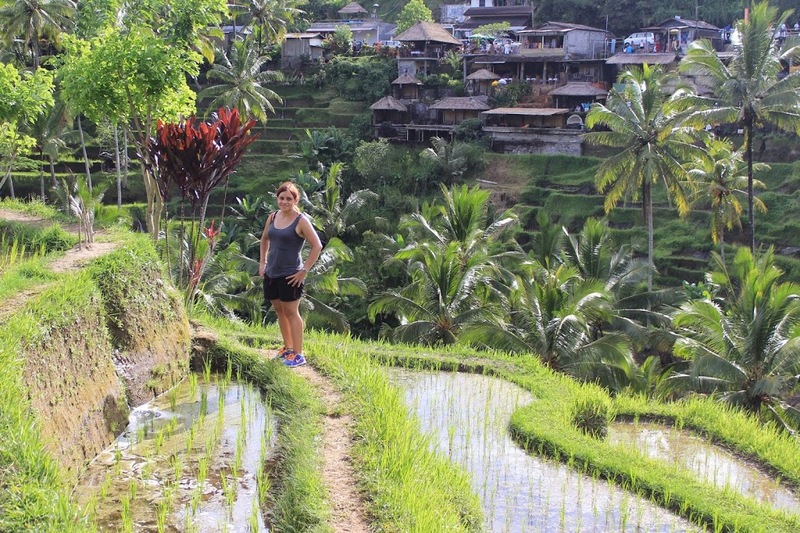 She also accompanied me to rice terraces and a coffee plantation, where one of the person in charge actually took the time to sit down with us and converse at length about the coffee plantations. 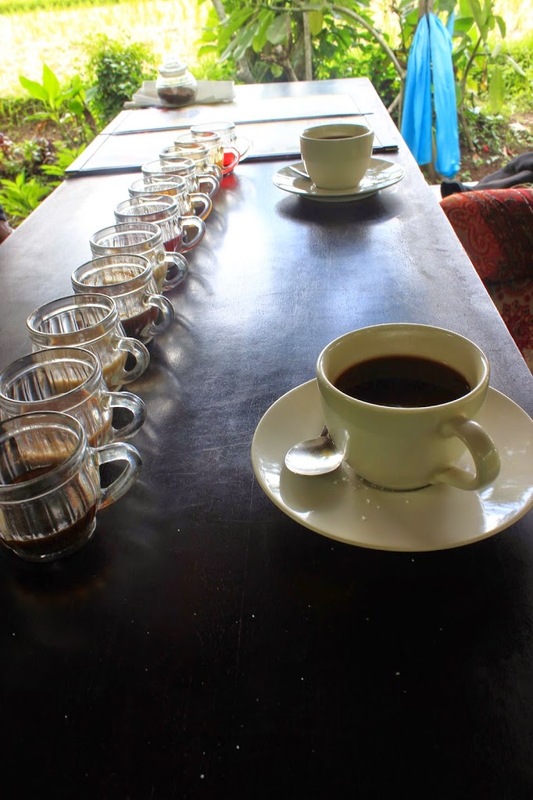 We also discussed the Luwak Coffee making process. I have strong suspicions that this conversation would never have happened if I had gone alone as a tourist. When coffee beans, which grows in trees, becomes ripe and red, it is then eaten by a palm civet (a ferret like animal). The bean goes through its digestive track, which alters it. Once the animal execrate it, the bean is thoroughly sanitized before being roasted. This gives you the world’s most expensive coffee (although I have heard of this new process using the digestive tracks of elephants, which could be more expensive now). After tasting the said coffee, I can say the final product is a coffee much less bitter and much more velvety than the regular Balinese coffee, or any other black coffee I have ever tasted. Next was a hike through rice terraces. It was extremely hot that day, which made the process rather physically demanding. We walked along the rice banks, careful to avoid walking on the rice shoots. Rice terraces are layered platforms built out of a hill side. They forms banks, which are inundated and in which the rice plants grow. A lot of water is required to grow rice, which makes the terrace system that much more efficient when you look at the way irrigation is done. The water from the top platform will flow down, ensuring efficient irrigation of the whole terrace system. 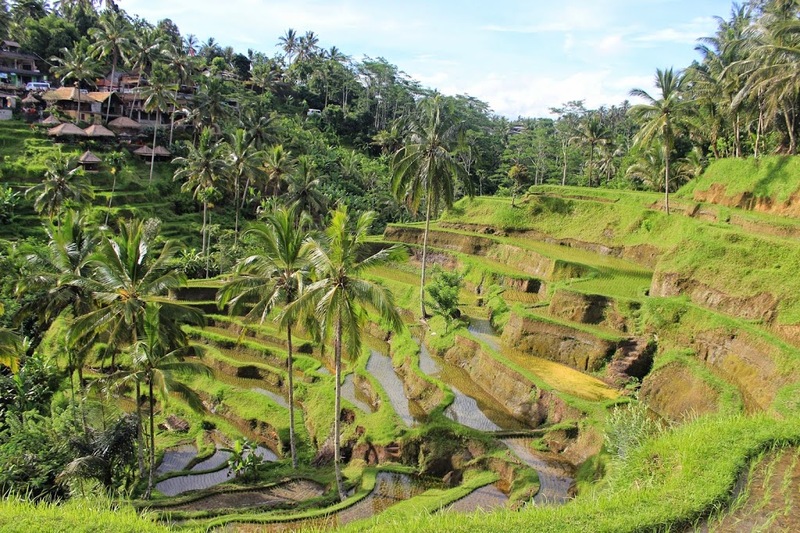 I thought I understood the concept of rice growing when I looked at rice plantations, but my enchantment only grew when I stood before actual rice terraces. Comparing a leveled rice field to a terrace, would be a bit like comparing a countryside rock wall to the Great Wall of China. I also got to see a traditional market, bustling with life, without actually being harassed by vendors. This again was probably due to the fact people thought I was an expat living in Bali and was simply doing my groceries with my Balinese friend. It was obviously not westerner’s friendly as there were live chicken as well as whole chicken and pigs (complete with the head) for sale. As I looked at the stalls I could recognize some of the things, while some other items were unknown to me. This somewhat reminded me of farmer’s markets back home, but in a totally foreign way… Being in Bali, I wouldn’t have expected it any other way. This was a very good glimpse at everyday life. Another important moment for me was the day we spent in Arya’s family in a small village about an hour and a half away from Denpasar. She had not warned her mother of my coming because she didn’t want her mother to spend all day preparing for our visit. She wanted this to be a laid back everyday type of day. I got to taste all kind of fruits I didn’t even know existed like the mangosteen (which I absolutely loved), the snake fruit, the jack fruit and the durian (also known as the “stinky fruit”). We got to relax in a sort of elevated gazebo with no wall and I got to see her family temple. How incredible is it that every family in Bali has one of those temples at home. I’m not talking about a shrine here, but a full blown permanent structure. Granted, the size of said temples varies according to the family revenue, but still even a small temple is a temple! Her mother really went out of her way to make me comfortable and to be hospitable. She pushed bowls of fruits and cookies my way and insisted I enjoy a coconut to drink as well as a coffee. I was really full by the end of the visit! Yet, that wasn’t all, I noticed her slipping some sort of crackers in my backpack when she thought I wasn’t looking… But I didn’t dare say anything, because it was such a well-meaning gesture. It was also nice not to have people in the village staring at me so much, which I will admit can get tiring. I got a different type of attention, one of heartfelt curiosity and interest. This was a much better representation of Bali’s fabled hospitality than what I witnessed in Ubud or Kuta. I got to learn so much about life here. I was really fascinated by the teeth filing ritual, which seems as important of an event as the first communion for Christians. The canines represent the evil aspects of human nature, such as lust, greed, anger, insobriety, confusion and jealousy. The idea is that with this teeth filing ritual, in which you literally file away the tip of the canines, you become a better person. It’s a rite of passage, from what I understood. Dr. Aria is an unusual soul. at my request, she kindly helped us in visiting Blai too. At certain moments i had to stop and ask her, whether all Balinese are as nice as she. Such an amazing person! During our stay at Bali I observed that she was ready to take trouble for helping us to enjoy our trip. The best part was when she took me visit Ubud on Bicycle. She took the lead and guided me though lush hilly beautiful Balinese sites. The day was quite hot, the way was winding and difficult; and all the way I wondered at the kindness of her that how much she endured to show me as much as I wanted. I am indebted for life long on her hospitality and warmth.